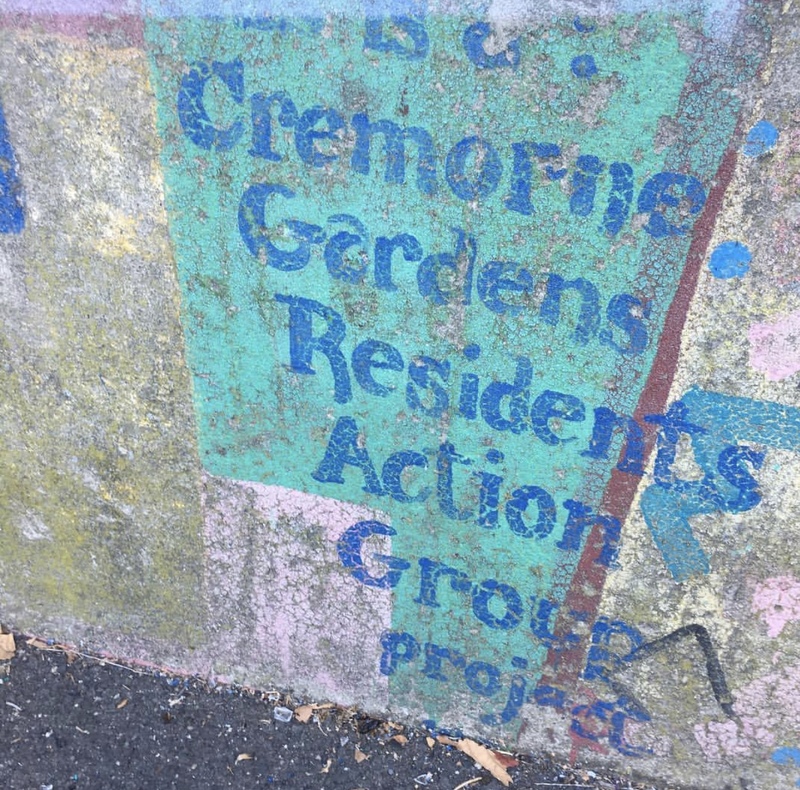 “So the way it all started was, there was an action group [Cremorne Residents Action Group] and one of the original people in the group lived it the area, Ann Hurley. Ann lived in Wellington Street and probably still does. I did art under her [at secondary school]. 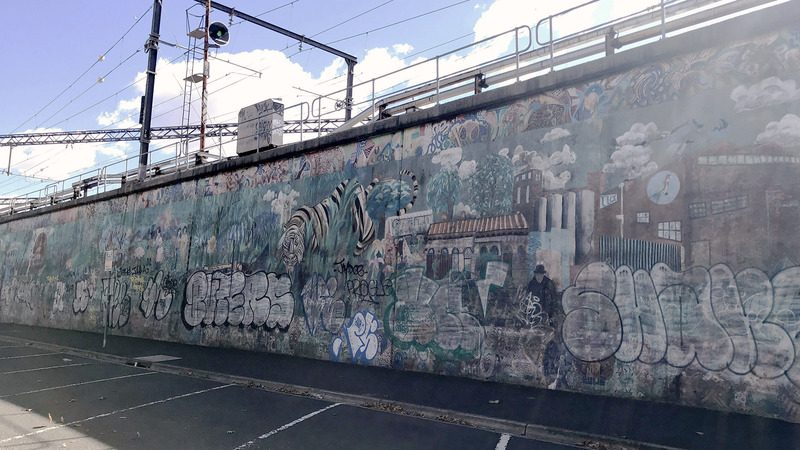 She was just one of the people involved and they got a grant from the government to paint the big concrete wall – a grant to paint a mural that became a commonwealth employment project. It was quite a lot of money. So they got together a mural group, of painters. There was a lot of media, in newspapers mainly, about the project. There was a lot of background research, a file and a photo montage of black and white photographs. Two people involved were Brett and Rosemary. One was the lead mural painter. Rosemary was really experienced. The project needed the ground person and that was me. It was a commonwealth ‘work for the dole’ program. I’d moved out of home early and lived in Dover Street.The job was painting the mural. It was a six month project. It was over winter, from April to October.There were five of us. One young and other experienced people. A condition of the grant was consulting the community. We developed a questionnaire – and the five of us split up into a section of Cremorne each to door knock. We knocked on every door in Cremorne to ask people what they wanted on the mural. After that we set up a traders stall for a week, out the front of Dimmy’s to ask passing people what they wanted on the mural and then collated all the information.People wanted the history. A bandstand, ‘History and greenery’. Something that came up again and again was there was not enough greenery. People wished they could live in a jungle and have trees. We got an artist space. We designed the mural in this space. The design was 2 metres long on a roll scroll. Once we’d designed it, we put the design in Dimmey’s window and sat there with the stall. We wanted to check this off with the community and see if people wanted changes.From this we ended up adding a border. People wanted to have the primary school children involved and for them to paint and have their say. We added a 1 metre border right around the design. We contacted every primary school. They did the bottom. Children did the art with the smocks. And it was tiled right around the edge. The space where we worked was like a church with artist in residents.We then converted the mural design onto the wall by making a grid. To be able to do this we needed to get our scaffolding license. We needed to do a full course at Collingwood Tafe to learn how to construct scaffolding . We were the first two girls to get a scaffolding license in Australia. We learnt it and got 100%! We [Rosemary and Simone] then had to make scaffolding on a five metre building on a building site. We needed to have the scaffolding so we had to know how to build scaffolding so it was safe as we needed to keep rebuilding it as we moved along. The scaffolding was scaffolding on a trolley with a ladder and cross beams. We had masses of paint. There was a brothel opposite the mural and they let us store the 100s of cans of paint. We whitewashed the wall and painted from one end to the other. The sketch outline was added and then we painted. We visited other murals in Melbourne and talked to the people who did the others. One in Williamstown and one in Collingwood, at the Tafe in Collingwood.The mural took six month until the last tile was painted. All the shoes were painted on the life sized people but then the pavement went over these as it was raised so you could no longer see the shoes. The artists were painted on the mural. We had portraits of ourselves on there. There were photographers that came all the time, it was well documented. Urban greenery is something the current community have suggested is needed. This is the same theme that came out from when we consulted with the community. People felt they were walking in a prison, with the big grey wall and that’s why they wanted the ‘jungle’. Cremorne Pleasure Gardens, the band stand, the hot air balloons – the history. Everyone wanted a mural under the bridge.. but because of car fumes it was considered too dangerous to spend that much time there painting. Again, it felt like a prison, walking under the bridge. About seven years after it had been painted it started being painted over. They got some good polyurethane cover and they protected it. The residents were protecting it. They used to come down with acetone to remove it without ruining the paint work by removing it using toothbrushes.Ten years later a cultural person from the City of Melbourne got in contact as they had wanted to preserve it. They came and got samples of the paint and did tests and produced a really detailed report for the City of Melbourne. The mural has held up well, the paint used and also the respect that no one has painted over it. That’s changed unfortunately as it’s been painted and tagged at base. Some locals have suggested they would contact Council to try to have it repainted in it’s original form. Do you have any thoughts on that? Repainting.. interesting that it’s stood test of time. And that it’s still visible. Because of the process, the process and consultation was such a big part, whatever the people wanted now. It’s all flaking and not fresh. There was so much detail. Rosemary, the artist, did the faces and all the parts that needed full detail like the lion and other parts. There’s been some talk about trying to get some public art up on the long grey wall. We tried to make everyone’s ideas get incorporated so it started with the jungle… and then moved at the other end to being more contemporary. They imaged a timeline… the Dimmey’s ball, there was the fruit stand – Richmond trading old worldly market. The older ones went into Squizzy Taylor. Travelling through time continuing along the wall. That’s something that could be taken through and extended along the wall. The jungle or greenery theme could be taken further. Extending the timeline along the wall.The job program – painting that mural, that was definitely something that I benefited from. It could be good to fund other unemployed young people with potential in the arts. The program enabled me to become part of the Swinburne graphic design program. I wouldn’t have got into that program had it not been for the mural.